The federal cloud computing market is nothing if not confusing. Despite the best efforts of technical personnel at the National Institute of Standards and Technology to define what cloud is, the cloud market has come to encompass goods and services well beyond the narrow definitions of Infrastructure, Platform, and Software-as-a-Service. Understanding this is important for industry, because the complexity of the cloud market means finding business opportunities is that much harder. Take for example the booming business of migrating agency datasets to big hosting companies like Amazon Web Services. AWS provides the cloud (the IaaS), but another vendor does the migration work. In this context, what part of the work should be considered cloud computing? The hosting services provided by AWS are clearly cloud, as defined by the NIST, but without the data migration work done by the industry partner, AWS provides nothing. The industry partner is a critical piece of the cloud puzzle, so should the migration work not also be considered part of the cloud market? At Deltek, we call these types of services “cloud enabling” and we consider them to be part of the cloud computing paradigm. Therefore, we include spending on those services in our analysis of the federal cloud market. So, if cloud enabling services fit into a broader definition of the market, is your business development team searching for opportunities to do this kind of work? Services like data migration are one shade of gray among many. An even more challenging trend that has emerged within the last couple of years is the use of the term “cloud” to describe a network of communications hardware and switches. This term first came to my attention in the early stages of the Defense Department’s implementation of multi-protocol label switching routers for the Joint Information Environment. Referred to as an MPLS cloud, the “cloudiness” of the MPLS gear appears to refer to the scalability of the hardware, but does the MPLS cloud really fit the definitions of cloud provided by NIST? The DoD is now taking the cloud analogy one step further, referring to sensor arrays as clouds. Are sensor arrays cloud computing? Their description as cloud confuses the issue quite a bit. Seeking clarity in the terminology is not simply the complaint of a picky analyst. Consider the following. Using cloud terms for things that are not cloud has a serious impact on our understanding of the market and the size of the business opportunity related to cloud. For example, the Federal Aviation Administration has requested $24.3 million in FY 2016 for its Terminal Voice Switch Replacement program. The TVSR “replaces aging and obsolete voice switches” related to air traffic control. These switches are basically boxes of hardware that enable the use of Voice over Internet Protocol (VoIP). In its FY 2016 IT budget request, the Department of Transportation requested $71.5 million for cloud computing. The question must be asked, however, if a collection of FAA switching hardware constitutes a cloud. If so, then cloud service providers may consider the size of the DOT cloud business opportunity to be $71.5 million. If not, the FY 2016 cloud opportunity at DOT is $47.2 million. Company leadership uses these figures to set expectations for the business opportunity available to their sales teams. Let’s say your company’s team is expected to capture 5% of the total cloud spend at the DOT and compensation levels are set accordingly. Does that total equal $3.5 million (5% of $71.5 million) or $2.35 million (5% of $47.2 million)? The distinction matters if your company doesn’t happen to sell the switching equipment that the DOT calls cloud. The correct use of terminology is important because the definition of cloud computing informs business decisions. If the definition is flawed, the resulting decision is as well. If that matters to your sales team and bottom line, you can see why the terminology matters and why clearing up the confusion is relevant. The Secretary of Defense, Ashton Carter, announced last week the release of the Department of Defense’s (DoD) new Cyber Strategy aimed at improving the their cyber capabilities. One theme focuses on leveraging cybersecurity research and development (R&D) to accelerate these capabilities. So how much money might DoD be directing toward cyber R&D? The stated purpose of the new Department of Defense Cyber Strategy is to guide the development of DoD's cyber forces and strengthen its cyber defense and cyber deterrence posture. The strategy focuses on building cyber capabilities and organizations for DoD’s three cyber missions: defend DoD networks, systems, and information; defend the United States and its interests against cyberattacks of significant consequence; and provide integrated cyber capabilities to support military operations and contingency plans. The strategy sets five strategic goals and establishes specific objectives for DoD to achieve over the next five years and beyond. Under the first strategic goal in the area of building technical capabilities for cyber operations the DoD is setting an objective to accelerate innovative cyber research and development (R&D) to build their cyber capabilities, looking to both the existing DoD R&D community and to established and emerging private sector partners for help in developing “leap-ahead technologies” that can aid U.S. cyber-defenses. To that end, DoD plans to focus its basic and applied R&D on developing cyber capabilities to expand the capacity of overall cyber workforce. The R&D dollars depicted above are just part of the story. There is other cyber-related R&D spending embedded in larger efforts that contain cybersecurity elements or impacts, but ferreting out those dollars is gets tricky and can be even more imprecise. The point here is to get a sense of the size of the overall investment and where these dollars tend to be directed. While it is important to recognize that not all of these dollars will be spent on contracts with industry partners for R&D services and technologies, the fact remains that the sustained need by DoD for more advanced cyber technologies and tools is likely to grow in both real terms and in proportion to other R&D areas. In fact, the investment in this push for greater cyber tools may easily outpace the growth rate for other areas of contractor-addressable cybersecurity within DoD. This is especially true in the support services area as the DoD strives to develop thousands of uniformed cybersecurity personnel in the coming years. One thing seems for certain, the DoD recognizes its need to cover a lot of ground quickly when it comes to improving its cybersecurity capabilities and posture and they are looking to harness creative energies to address the need. In many ways, it’s not unlike past challenges where they have looked to partners in industry and elsewhere to come up with creative solutions. Who knows? Soon we could be looking at the cyber equivalent of duct tape. There is rarely a day that goes by when you won’t see a top story on cybersecurity and the scarcity of people with the right IT security skills to address the growing challenges. It is this very demand for skilled cybersecurity staff that is driving some new, creative, and some might say bold efforts by the Army and the Department of Homeland Security (DHS) to raise up, recruit, and retain talent. The Department of Defense (DoD) may be the one federal entity where building a cyber workforce is the most prominent, as they continue to grow a cadre of uniformed cyberwarriors to staff various cyber commands and other network defense organizations, like the Joint Task Force-DoD Information Networks (JTF-DoDIN). However, building the force is only part of the challenge. Once their tour of service commitment is fulfilled these skilled cyberwarriors often have the attractive option to land high-paying jobs in the private sector, so the sustainability of a cyber-force is a major DoD priority. Recognizing these realities is a driving force behind the establishment of the Army Reserve's Cyber Private Public Partnership, or Cyber P3, among the DoD, universities and private employers. In recent comments in a story by Nextgov, Cyber P3 program manager Lt. Col. Scott Nelson said that the program is trying to answer key questions of "how do we retain the investment the Army made in that soldier" and also "allow them to get a really good job with our industry partners?" The Pentagon is not the only federal agency looking to industry to bolster its long-term cybersecurity posture. The Department of Homeland Security Secretary Jeh Johnson announced at the RSA Conference in San Francisco that DHS is opening a cybersecurity branch office in Silicon Valley to “strengthen critical relationships… and ensure that the government and the private sector benefit from each other’s research and development.” Collaboration and synergy is not the only thing on Johnson’s mind, however. He’s recruiting. He intends to “convince some of the talented workforce in Silicon Valley to come to Washington,” highlighting the new United States Digital Service program that provides mechanisms for tech talent in private industry to complete a “tour of service” within government agencies. But on a more formal level, Johnson is “on the hunt” for a cybersecurity “all-star” to head up DHS' National Cybersecurity and Communications Integration Center (NCCIC), promising a direct reporting and communications line to the department Secretary, i.e. Himself. These efforts, and others, underscored the ongoing urgency and scope expansion of cybersecurity into nearly every area of modern life. As the “Internet of Things” (IoT) continues to march on – bringing digitization, sensor-ization and connectivity to everything from communications to home appliances and motor vehicles – securing this infrastructure from exploitation and destruction becomes even more critical. Further, the farther down the cybersecurity road we go, the more it becomes apparent that there is only so much we may be able to automate with tools – at least for now. This is especially true when it comes to decision-making and rapid response. Skilled people are critical, in high demand, and in short supply. These efforts by the DoD, DHS, and others will take time to build the pipeline necessary to meet the demand. It will likely take years, not a cheerful prospect when one considers the growing threats we face. Meanwhile, the competition for these skills will remain fierce. In testimony that flew under the radar a few weeks back, four senior Army commanders gave statements before the Senate Armed Services Committee Subcommittee on Air-Land concerning the Fiscal Year 2016 budget request and the U.S. Army’s Strategy, Readiness, and Equipment Modernization. In that testimony, the Army’s officials made clear the detrimental impact that sequestration and the declining Army budget is having on the force’s readiness. They also outlined how the Army is shifting funding to priorities that will enable it to maximize the use of the budget dollars it receives. First, the Army will fully fund its Combat Training Centers (CTC). Specifically, more money will be dedicated to refresh technology at the National Training Center, Joint Readiness Training Center, and the Joint Multi-National Readiness Center. A particular area of investment will be new Instrumentation and Training Aids, Devices, Simulators, and Simulations (ITADSS) used to train Brigade Combat Teams. This priority fits well with previous statements by Army officials specifying that spending on virtual training tools and systems will be a focus in the coming years. This spending should benefit vendors providing cloud-based training capabilities as well, as the Army seeks to make use of the latest technology. The Maneuver CTCs will also refresh obsolete instrumentation data and Observer/Controller Communications System network infrastructure that supports Forward Operating Base operations and Mission Rehearsal Exercises. The current system has experienced network outages that inhibit efficient training operations. Enhancing network security capabilities – wired and wireless – will be a priority here. Third, the Army will retain a particular focus on ISR assets like unmanned systems. This priority is reflected in the FY 2016 Army budget request for Research and Development. For R&D programs directly related to unmanned systems, the Army is requesting $218 million in FY 2016. Taking into account those programs which have a related unmanned system component, the requested budget climbs to just over $285 million. These totals are down from the more than $300 million the Army spent annually on unmanned systems in FY 2014 and 2015. Nevertheless, the requested amount indicates continued strong interest as the Army seeks ways to use technology to make up for the declining number of troops in the ranks. Summing up, Army officials stressed that they will protect investments in technologies, particularly commercial-off-the-shelf technologies, that will help U.S. soldiers maintain overmatch capabilities against adversaries. The technologies mentioned during the testimony did not include cloud computing or big data analytics, but industry may rest assured that the Army is very interested in both of these things, especially for the collection and analysis of intelligence data that boosts the combat efficiency and lethality of U.S. forces. The U.S. Army today faces significant budgetary and technological challenges. The fiscal limitations alone cannot be underestimated. With the Army’s annual budget falling the last several years, military leaders have been forced to cut both programs and personnel. Current projections show that by FY 2019 the number of active Army personnel will slide to 420,000 troops, down 14.3% from the current level of 490,000. Rapid technological change is also altering the circumstances under which Army personnel operate, as potential adversaries with advanced technical capabilities, particularly in the area of electronic warfare, challenge U.S. military supremacy. In response to these challenges, the Army is turning to ever more advanced platforms for intelligence gathering and electronic warfare, particularly platforms that are unmanned and/or robotic. These platforms are unlike previous generations of technology in that they continuously generate vast amounts of data. This data requires analysis, which is a potential boon to vendors that offer advanced analytic capabilities. There are, however, other areas related to unmanned systems where information technology vendors can find business opportunity. These include modeling and simulation, algorithm design, software development, autonomy/artificial intelligence, testing, machine learning, cyber security, and electronic warfare-cyber convergence. The Army’s investment in unmanned systems is symptomatic of the fundamental transformation of modern warfare into a seamlessly intertwined network of weapons systems, surveillance platforms, and IT capabilities. It therefore behooves those of us tracking federal IT to keep an eye on unmanned systems spending for the business opportunities it presents. The table below shows programs directly related to the development and fielding of unmanned systems, as listed in the Army’s Research, Development, Test, and Evaluation budget request for FY 2016. Generally speaking, this part of the Army’s budget request includes dollars that will be spent on research and development efforts. It is often considered to be “new” money the Army is asking for, unlike the funding it requests for Operations and Maintenance, Military Construction, etc. As we can see, the Army invests a lot on unmanned systems. This RDT&E spending amounted to nearly $263 million in FY 2014 alone. In FY 2015, the Army anticipates spending almost $289 million. In FY 2016, however, investment drops-off to roughly $218 million. There is no data to explain this decline, but my assumption is that planners have factored in the threat of sequestration. It is worth noting that the development effort surrounding every one of these systems has one or more IT components related to it. These components include systems design, software engineering, and testing, among a myriad of other activities. The work is generally centered at the Army Research Laboratory, although considerable effort also takes place at the Communications-Electronics Research, Development and Engineering Center (CERDEC). Finally, the programs listed above are those which deal directly with unmanned systems. There is also work related to unmanned systems in programs where unmanned systems are but one part of a larger effort. For these programs, the Army has requested $285 million in FY 2016, making the pot that much sweeter in the coming fiscal year. The Department of Defense is investing big in goods and services related to big data. This investment, however, is not spread evenly across the department. It exists instead in certain agencies where the spending is deep and related to a variety of other programs. One of these agencies is Defense Advanced Research Projects Agency, or DARPA, as it is commonly known. DARPA does research and assessments related to the applicability of cutting edge technologies to U.S. national security, including unmanned systems, robotics, cyber security, mobility, networking and computing technologies, and others. Underlying the research and development work at DARPA are significant investments in advanced algorithms, analytics, and data fusion that illustrate the importance of “big data” to the efficient use of next generation systems and weapons platforms. Put differently, more and more of DoD’s weapons and communications systems, as well as the platforms that carry them, are becoming extremely complex. They are now so complex, in fact, that big data analytics and algorithms are necessary for them to function properly. Big data analytics and algorithms are thus a foundational technology without which an increasing number of advanced DoD weapons systems and platforms would not function. Knowing this makes a big difference when it comes to understanding where business opportunity can be found at the DoD. Big data is such a complex subject, and its uses are so varied, that it is rare if an acquisition calls explicitly for a specific solution by name or the term “big data.” This makes selling big data solutions and services to defense customers tricky. Getting back to DARPA, the fact is that big data is in use across the agency. It appears primarily in R&D work related to software development, algorithm design, and data fusion efforts. The two tables below identify programs that have big data requirements related to them. Table 1 lists DARPA programs in which big data goods or services are the primary requirement. Table 2 shows DARPA programs in which big data requirements are but one of many different pieces of work. These programs have been drawn from the DARPA Research, Development, Test, and Evaluation Budget Request for FY 2016. As we can see in Table 1, spending rises from approximately $97 million in FY 2014, to the $164 million that DARPA forecasts in FY 2016. This represents a projected 69% increase over the course of three fiscal years. Turning to the list of programs that includes both big data specific projects and those with a big data component (the gold lines in Table 2 below), we can see that the trend is the same – spending at DARPA on big data related R&D is on the rise. The increase is a more modest 21% from FY 2014 to FY 2016, but this is still a positive return in an overall declining DoD technology market. Summing up, the DoD’s spending on big data, particularly on R&D, is rising. Because money is flowing to R&D efforts, the fact that the work is related to big data may be hidden in general project descriptions. The best thing to do when searching for big data related work is to seek out complexity. Where agencies like DARPA are conducting R&D work on complex systems, the integration of massive volumes of sensor data, the development of advanced algorithms for controlling unmanned systems, and/or fusing large data sets into common pictures, that is where you’ll find big data related spending. Continuing to enhance the throughput capacity of its networks by implementing multi-protocol label switching routers. Selecting applications that will either be killed or selected for migration to a cloud-based environment. Utilizing data center services provided by the Defense Information Systems Agency to the furthest extent possible. Expanding the development and deployment of cloud-based technologies for disconnected and tactical environments. Ruthlessly standardizing IT hardware on common standards that comply with the Army’s various Common Operating Environments. Implementing the governance processes and procedures necessary for selecting cloud services appropriate to the mission requirement being fulfilled. In addition to formalizing the foundational aspects for Army’s adoption of cloud, the ACCS makes several things clear about the Army’s intended use of cloud that have implications for the acquisition of those services in the future. First, cloud computing adoption in the Army will be overseen by the Army Application Migration Business Office – Product Director Enterprise Computing at the Program Executive Office Enterprise Information Systems. PD EC has been authorized to assist commands with the system and procurement planning necessary for moving applications to the cloud, meaning that vendors should keep close tabs on what’s happening there. It is worth thinking about how Army customers will acquire cloud services with PD EC designated as the coordinating organization. The acquisition of enterprise technology services is PEO EIS’ primary function, strongly suggesting that PD EC will either put a multiple award contract in place to provide vendor migration and other cloud services, or it will use vehicles that are pending and/or are already in place across government. In this context the follow-on to IT Enterprise Solutions – 2 Services looms large. Not only are PEO EIS vehicles mandated for Army customers, the PEO is also looking for ways to streamline its contract operations. Adding cloud to the services provided by ITES vendors would effectively kill two birds with one stone by using a vehicle already in the process of being competed for the work. This said, the award of ITES-3S is a long way off and protests are guaranteed to hold it up even longer. PD EC is therefore likely to use other procurement tools, like GSA’s IT 70, the Alliant contracts, and/or a blanket purchase agreement to fulfill cloud requirements. The second revelation from the ACCS is the first detailed listing I’ve seen of the types of systems that the DoD classifies as having a “low” data impact level. These systems, including testing and development efforts, library systems, and public websites are classified at data impact level 2 and are the most likely to be moved to the cloud first. After these systems, the bar rises fairly quickly to data impact level 4 for many training systems, morale systems, and lodging systems. In short, being certified at the data impact “low” level isn’t likely to generate vendors much cloud business at the DoD. It is much more preferable to be certified at the moderate and high levels of 4 and above. That is where the real money will be. A recent survey of federal agency leadership explored drivers behind the uneven adoption of shared services for acquisition, human resources, and information technology. Delving into agency business cases sheds light on which agencies are leading the way with transitioning major information technology efforts to shared service environments. In March 2015, the Partnership for Public Service and Deloitte released findings from a survey on shared services progress. Researchers interviewed CFOs and leaders from 18 of CFO agencies to take stock of federal shared services including the attitudes and efforts underway across acquisition, human resources (HR), and information technology (IT). The respondents offered varying perspectives on government buying. Some viewed agencies as independent service providers, which may lend a competitive aspect to shared service arrangements. Others are inclined to see government as a single purchaser, which contributes to a more collaborative environment. Over half of respondents (55%) indicated that terminating or transitioning services was difficult. 28% suggested it was a moderate challenge, and 17% said it was easy. 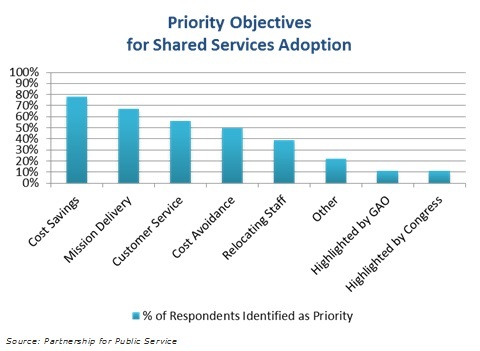 Survey respondents identified primary objectives for adopting or expanding shared service use. The top drivers included cost savings (78%), mission delivery (67%), customer service (56%), and cost avoidance (50%). The survey findings stopped short of offering assessing the status of each of the agencies. However, agency budget materials provide some insight for plans related to shared services. According to the Office of Management and Budget’s exhibit of business cases for major IT investments, federal agencies identified 738 major efforts totaling $43,609.1 million in their FY2016 budget request submissions. 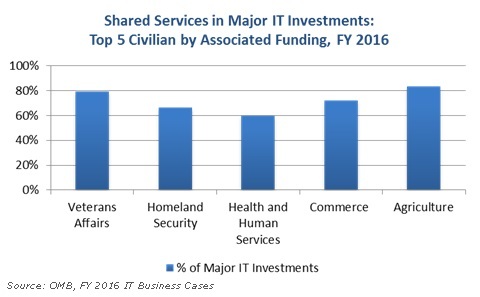 Of these investments, 383 include current or planned shared service spending, nearly 52% of those major IT efforts. Across the Department of Defense’s 124 major investments, 41 include current or planned efforts for shared services. Total funding associated with these efforts totals over $7.3 billion. Due the nature of the data reported, it is unclear what portion of those resources will be directed toward shared services. 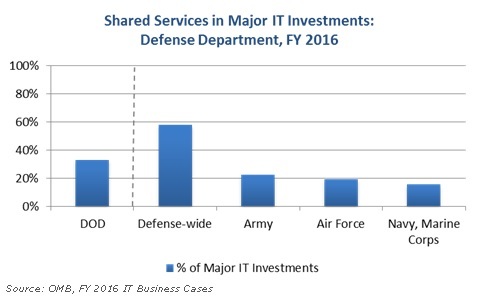 Of the major investments planned Defense-wide, 58% involve shared services. Across the Army’s 31 major efforts, 23% have current or planned shared service elements. 19%of the Air Force’s 31 major investments include shared services, and 16% of the 19 major IT projects for the Navy and Marine Corps do as well. Analysis of the major investments across civilian agencies highlights the range of adoption progress across organizations. By the level of spending associated with those investments, the top five civilian agencies for shared services are Veterans Affairs, Homeland Security, Health and Human Services, the Department of Commerce, and the Department of Agriculture. 79% of the 24 major investments at the Department of Veterans Affairs include current or planned spending on shared services. At the Department of Homeland Security, 66% of 89 major investments involved shared services. Within Health and Human Services, 60% of 94 major efforts include shared services components. 72% of the 23 major investments detailed for the Department of Commerce have shared service elements. The Department of Agriculture reported on 24 major IT efforts, 83% of which include shared services. Total funding associated with these major investments across the top five agencies combines to roughly $12,070 million. As with the Defense Department, the portion of each fund intended for shared services is not specified. Agencies are approaching shared services as a means to increase operational and cost efficiencies. In some cases, concerns about mission delivery contribute to some reluctance to relinquish program control. In others, the ability to standardize and ensure consistency of services is helping shared services gain traction. Additionally, agency leaders are working to resolve uncertainty about specific benefits and costs associated with the move to shared services in order to decide if it’s right for a particular organization. Given the varied landscape of mission and program requirements across the government, it’s hardly surprising that there’s a range of positions and approaches in play for how shared services are being implemented.